Today’s media speculation over an announcement about Network Rail difficulties with the CP5 improvement & electrification programme has sparked a predictably ill-informed frenzy of speculation about Hs2 from the anti campaign. Ignoring the fact the overwhelming majority of them have absolutely no idea how either Network Rail or Hs2 Ltd are funded and structured (or the relationship between the two) they fearlessly leap in with both feet. Here’s a couple of examples. I wonder how long it will take before reality sinks in and they realise that, whatever difficulties Network Rail are having with CP5 delivery (and those difficulties are real) it will have absolutely no impact on the progress of Hs2? As I type this, Transport Minister Patrick McLoughlin is talking about the problems in Parliament. I don’t expect any surprises. The industry & its commentators have known about Network Rails travails for a long time – even if it’s a revelation to the Hs2 antis. What will be interesting to see is not so much a reiteration of the problems as much as what solutions are on offer. Will MML & TPE electrification be delayed? Almost certainly. But what’s the recovery plan & where does this leave the rolling stock cascades? I’ll look forward to seeing what McLoughlin says & how both Network Rail & the ORR respond. Whilst the announcement of a delay to Trans-Pennine electrification is frustrating it’s been talked about for months. In fact, it’s no bad thing as the reworked scheme will deliver far more than the original ‘plain vanilla’ plans. So, what lessons should be learned. Consistency & continuity for one. Electrification schemes were like buses, they all came at once. What the industry needs is a consistent workflow & this has been sadly lacking. The blame for this lies at the door of Government & the DfT, not Network Rail. Add in the skills shortages caused by stop-start plans & its hardly surprising that trying to deliver so many major schemes at the same time was going to cause problems. The question is – will anyone learn from this, admit the problems, or are we going to see the blame game in full swing? Whatever the answers, you can be sure of one thing. There’ll be no crumbs of comfort for the Hs2 antis. – is the mantra of the anti Hs2 mob. Well today has exposed why – although they’ll miss this point by a country mile! Modernising or simply electrifying an existing line is a project fraught with difficulty, not least the fact you’ve got to do it whilst you keep the line open. This means working during possessions at night or at weekends. It’s a very expensive way of doing things and all the staff working on or about the line have to have PTS (Personal Track Safety) certification*. It requires specialist contractors too, with all the right disciplines. Also, the actual window for doing any real work is short. A lot of time (& money) is wasted getting men & materials to from the sight between each possession. Take a look at the picture below. All this kit is only on track for a few hours, the rest of the time it’s idle. Unless you’ve done a job like this you’ve no idea how much time is spent kicking your heels. Building a new line is rather different. It’s mostly a straight civil engineering project that can be done in normal working hours. 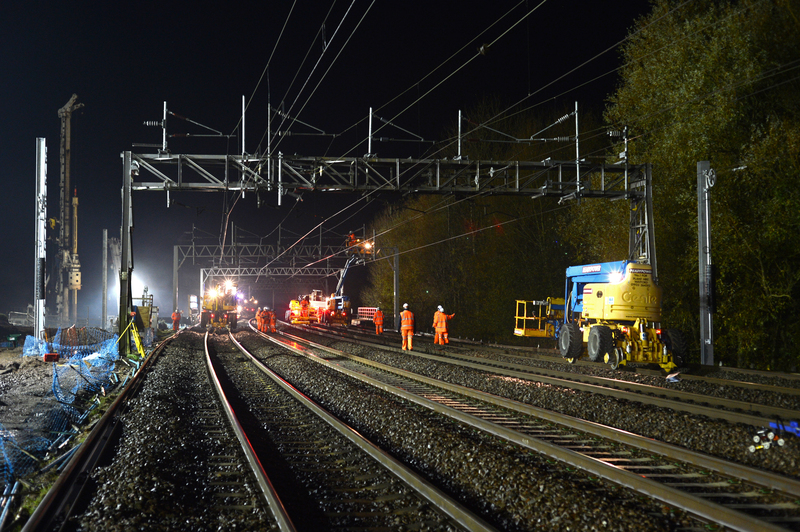 Only when the civils work is done do the specialists (the track workers, signal engineers & overhead line engineers) move in to lay the actual railway. None of this needs disrupt adjacent rail operation – as I’ve just seen at Norton Bridge on the Staffs Alliance. The only time major line possessions are needed is when you connect the interfaces between old & new. 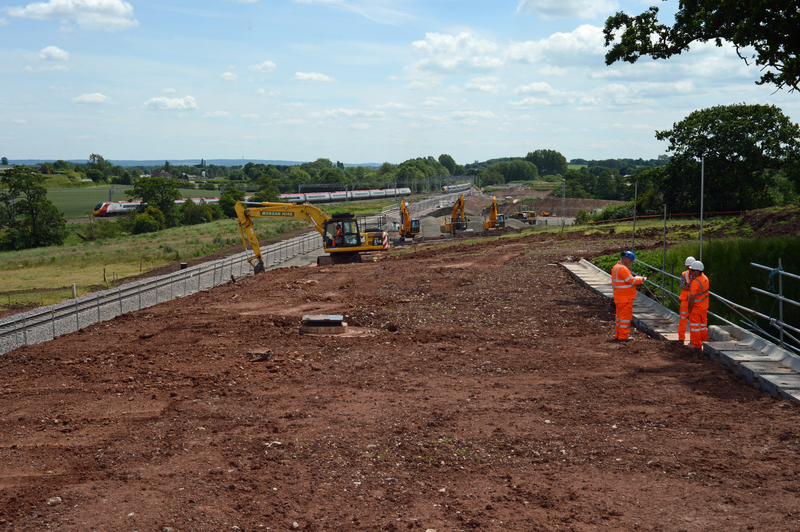 Here’s Norton Bridge where the existing line is kept open as the new one is built. When the builders have finished for the day, they turn the engines off & leave everything in situ till the next morning when work resumes. What will be interesting to see is the comedown after all the anti Hs2 mobs hyperventilating over the announcement. They don’t understand what’s going on, they’re desperate for a scrap of good news – and they think this is it. How will they feel the morning after the night before? I predict a hangover of mammoth proportions..